The Beaverton International Celebration is Saturday, Sep. 15. Applications are now open for performers, musicians and organizations to participate. 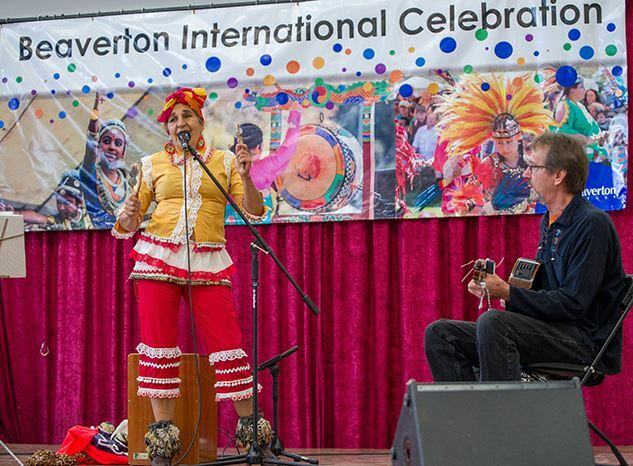 BEAVERTON, Ore. – Organizations, performers and musicians representing cultures from around the world are invited to participate in the Beaverton International Celebration! This year’s event will help kick-off National Welcoming Week and is a chance to celebrate our community’s diversity. The celebration will happen Saturday, Sep. 15 from 1 to 4 p.m. at the Conestoga Recreation and Aquatic Center located at 9985 SW 125th Ave. Applications are now open for performances, as well as tabling and exhibit opportunities. The Beaverton International Celebration is a publicly sponsored, non-commercial event, whose primary objective is cross-cultural exchange. There is no cost for tabling groups to participate. Tabling groups and exhibitors are allowed to sell hand-made cultural items or artwork but this should not be the primary focus of your participation. Stipends will be provided for performance groups. Interested groups should visit www.BeavertonOregon.gov/BIC for an online or downloadable application. The deadline to apply is Friday, Jul. 27 by 5 p.m. All applicants will be notified of their selection status by Friday, Aug. 3. For additional application and event information, contact 503-526-2559 or events@beavertonoregon.gov.